This workshop is designed to help painters of all skill levels develop their ability to practice effectively. 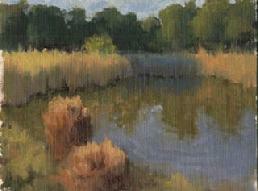 Using a limited palette, students will paint small studies on location. They will learn to see and capture the critical information. This skill is a springboard to growth and the studies are valuable references (more useful than photos) for larger studio pieces. Emphasis will be placed on the on the writings of John Carlson and Edgar Payne. Particular attention will be given to the four value planes, the five types of light and basic composition. This five day workshop will maintain an informative, productive and causal atmosphere. 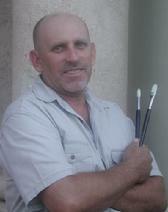 Robert alternates between starting each day with a brief outdoor lecture or an hour long demo. He spends the biggest portion of each day rotating from easel to easel offering encouragement and direction. �Basically we talk about plein air principles as group. I get to watch you paint and you get to watch me paint. I enjoy lots of personal time with each individual artist at their respective easel.� The workshop will close with a review of key principles and an encouraging critique of the week�s work. *All-inclusive plans are "Casa Santa Margherita" plans only. Air travel is not included and is the responsibility of each participant. Newly re-opened after a two and a half year remodeling and restoration! Wonderful location, ambience and all-new amenities, including Wi-Fi! Travel to Italy with Robert! Travel in the company of Robert from Tampa or Atlanta. Natural talent is nice if you have it, but talent is of little consequence unless it is developed. Real artistic growth is a product of hard work and perseverance. So please bring a good supply of both to the workshop. A good quality painting ground makes painting and learning easier. I highly recommend alkyd or oil primed Belgian linen. My preferences are #350DP or #359 mounted on gatorfoam available at www.windriverarts.com. I also occasionally use Classens #66 on gatorfoam available from Source Tec at www.canvaspanels.com. You will need (10) 8� x 10� grounds for the workshop. We will be using a palette limited to the three primary colors plus white. I use Gamsol which is an artist�s grade Odorless Mineral Spirits for thinning paint and cleaning brushes while painting and afterward. Please no turpentine or turpenoids. I also use an alkyd gel to control viscosity and accelerate drying time. Either Windsor Newton�s Liquin or Gamblin�s Neo Megilp will work. I prefer Utrecht Brand #209F available at www.utrechtart.com (great quality and price) or Robert Simmons Signet Series. You will need a portable easel designed for painting outdoors. I am currently using an Open Box M available at www.openboxm.com. I also own an EasyL available from www.artworkessentials.com. Miscellaneous Supplies8oz. or 20 oz. Brush Washer: This is a stainless steel, sealable, leak proof jar designed for Mineral Spirits. It has a stainless steel screen in the cup for cleaning brushes. Wear old clothes, apron or smock.